As April kicks into gear, people around the Round Rock area are looking forward to warmer weather. Although the area rarely sees snow, we all know what it’s like to have to deal with freezing rain and sleet. No wonder it’s such a relief to enjoy temperatures in the 80s! Folks start to spend more time outdoors in spring, getting their fill before wicked summer heat sets in. While you’re relaxing on the porch or tending the garden, give a thought to your roof – especially how changing weather affects it. Just a half hour away in Austin, the landscape is dotted with live oak trees that can cause a big stir if they get weighted down with ice. Branches or even the whole trunk can come down. No matter the size of your trees, spring is the time to prune back branches that may drop leaves into your roof’s gutters. Also look for signs of wood rot or pests and call a pro for removal. 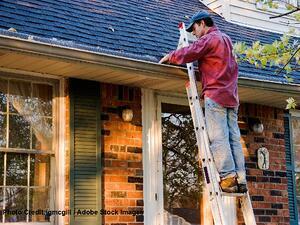 If you don’t clean out your gutters, they’ll clean you out – in repair costs, that is. Although it’s a chore nobody looks forward to, you shouldn’t overlook the importance of the gutters. When they are all clogged up with gunk, they can cause rain to run off your roof improperly and soak into the roof of your home or building. Ultimately, that may lead to trouble with your foundation. You don’t have to climb up on your roof to see issues that may need attention – in fact, you usually shouldn’t. A visual inspection of your roof will tell you a lot, particularly if it happens to be a shingle roof. Loose shingles and flashing are the most common things you would need a Round Rock roofer’s help for. Also look for dark, discolored spots which may signal mildew. If you notice problems on the surface of your roof, ceiling stains and roof leaks may be on the way. Luckily, you can take action to protect your entire home. Do your research now and select a Round Rock roofer to put in your list of contacts. Get a roof inspection done every 1-2 years for shingle roofs and 2-3 years for metal roofs. Spring is a terrific time of year to get it done, thanks to relatively mild weather and temperatures. At Longhorn Roofing, we strive to make it easy for you to get exceptional Round Rock roofing service all in one place. We’ve served Round Rock and the whole Austin area for more than 30 years. To learn more, contact us today. We look forward to helping you with your roof!